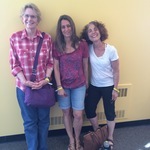 "Shelley Weinstock, '76, Lisa Pence, '75, and Deborah Bornstein-Gichan," by Shelley Weinstock, Lisa Pence et al. "I loved how we used to sit around the Dining Commons and all of us would be so excited about our different studies....It gave us the opportunity at that time to go, 'You know what? I've never taken that type of class. I think I want to.' And we could." Shelley Weinstock, Lisa Pence, and Deborah Bornstein-Gichan, '76, '75, and '76 respectively, were at Bard at a time when the Feminist Movement was just beginning to gain momentum: "I remember it being a very new idea. Feminism was a big, new idea and it was wonderful." Shelley found acceptance and encouragement as a woman in science, while Lisa and Deborah describe their experiences in the literature and dance departments. Together, the three speak of their reasons for attending Bard; what the college provided for them then and since in their lives and careers; and how much their friendships with each other and their classmates has meant through it all. Forty years on, an initial rebuff from a guy friend is now remembered with laughter and huge affection: "I'd go out with you, but I'm social climbing. I'm only dating seniors." Weinstock, Shelley; Pence, Lisa; and Bornstein-Gichan, Deborah, "Shelley Weinstock, '76, Lisa Pence, '75, and Deborah Bornstein-Gichan, '76 (BardCorps)" (2016). Oral Histories. 40.